Fantasy kingdom is a project of concord group a well established business company of Bangladesh. This group is pursuing new business opportunities because the world is not static. There have been many developments in the recent past that will affect us all both in Bangladesh and globally. But they have retained their strengths in the business sectors that laid the foundation of the group: Engineering & Construction, construction materials, and their qualified and professional people. They have grown with time and with Bangladesh, since Concord was established in 1972. Concord’s contribution to the infrastructural development of Bangladesh began with constructing war-damaged bridges in 1973. They have also diversified into various other fields which include ready-made garments, real estate development, manufacture of construction materials, amusement park. As their commitment is to improve the quality of life of the people in Bangladesh they tried to make a project in where they can give the people entertainment. They actually want to make the life of Bangladeshi people more enjoyable. They felt that they need to develop new types of business sector in Bangladesh. According to this thought they create a new type of business sector in Bangladesh and that is FantasyKingdom. Concord Entertainment Company brings the FantasyKingdom, A world class Entertainment Complex. So come and discover the magic of FantasyKingdom! The total project is financed by Concord group. No other short of investment are not invested in this sector. To make Bangladeshi people interested about world quality entertainment. 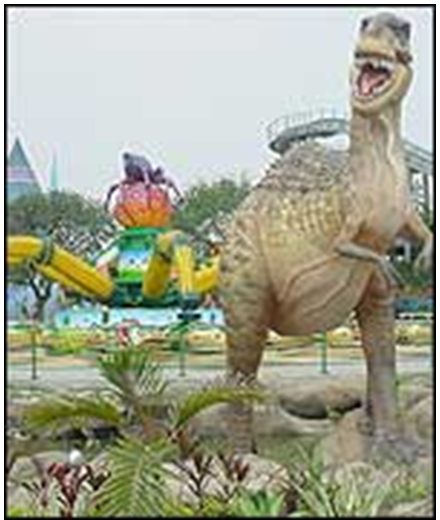 To make a new business sector in Bangladesh for amusement. To fulfill the social commitment. To spread the new theme of entertainment all over the Bangladesh. To survive in the market and to serve the people. Once upon a time, there was a magical kingdom of fun and excitement where Prince Ashu and Princess Lia along with their four extraordinary friends, Zipper, Zuzu, Bangasaur and Bobo, spent their days in fun and frolic, dancing and playing with the people of their kingdom. But with time, this mysterious kingdom disappeared because the people in Prince Ashu’s land had forgotten how to smile and became busy with their day to day lives. Then many years later, Prince Ashu recreated his lost kingdom here in Ashulia, Dhaka, so that people would forget their worries and again learn to smile and have fun. The landscape exudes that Old World charm, with gardens, fountains, statuettes, pillars and walkways that belong to a LostKingdom. The best of sculptors and landscape artists from around the world and Bangladesh have worked to invoke the spirits of this lost magical world. Their beauty will dazzle your eyes. 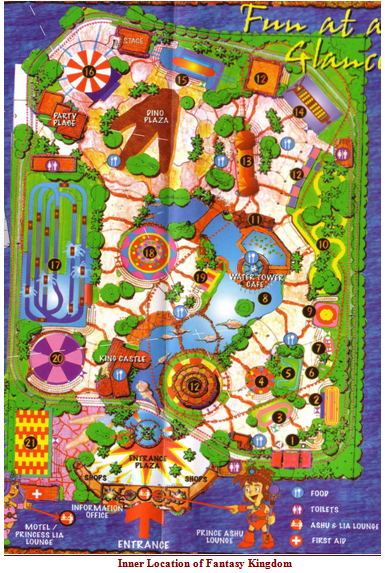 The park situated on Asulia and it is just 20 minutes from the city, on the Dhaka-Ashulia highway at a place called Jamgora, The Fantasy Kingdom is a magical kingdom of fun and excitement. The communication system between two places is very good. There are different bus services on this way and soon there are going some more bus services are going to add in this list. In normal weekdays the parks open at 11 am and the park closed at 09 pm. On other hand the parks open at 10 am and the park closed at 10 pm on Fridays or Holidays. There are different types of ride in FantasyKingdom. Some of them are really interesting. There were 16 rides when FantasyKingdom started its journey but now there are 26 rides. Prince Ashu, Princess Lia and their animal friends Zuzu, Bobo, zipper and Bangasaur are always at the park welcoming everyone with a smile. Oh and they have many games for you: Sack race, Whack the Donkey, the Egg race ….prepares to get egg on your face. Now I know how those poor sailors felt on the seven seas _ they must have been scared! Bangasuar’s favourite. It’s sOooo scary. Don’t eat before getting on this one! Oh my God!!! They drop you almost vertically and then they drop you again and again….. and you’re completely soaked afterwards. You can scream your lungs out but no one will hear you. The first time that Zipper rode the Roller Coaster, he didn’t faint…. he just stayed in bed for fur days because his legs were so shaky! Be a real life Desperado with a 32 Bore German Colt Pistol in your hand. Or race a Super Bike Grand Prix riding one of our powers packed 500 CC 150 HP in the Manx-CC … and many more video games. The Fantasy Troop performs some amazing dance routines. Afterwards the audience gets up on stage to show us what they can do. Are you brave enough to show the world that you too can dance like Hrithick and Karishma? The FantasyKingdom is providing foods and beverage facilities inside the Kingdom. These foods are produced by themselves and they sell these items inside their Kingdom. For this reason it is strictly prohibited to bring foods by the visitors. It can be mentioned another business policy, they are also generating revenue from this sector. FantasyKingdom is providing well protected security both inside and outside of their Kingdom’s territory. They have their own security system, close circuit camera, trained stuffs, and civil dressed security guard. It should also mention that they have a secured boundary all-around the Kingdom. In some unwanted situation they get help from Bangladesh Police, Rapid action battalion (RAB) etc. Bangladesh government providing them Aanser. 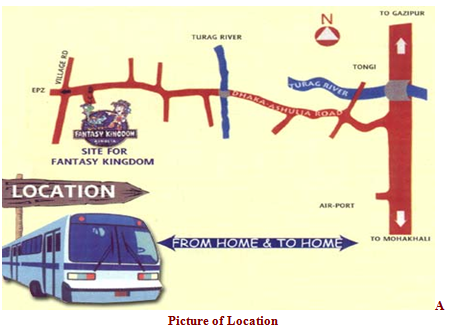 FantasyKingdom is providing parking facilities for those people who bring their own cars to visit the park. But this facility is not well enough when huge number of people gather to visit the park. 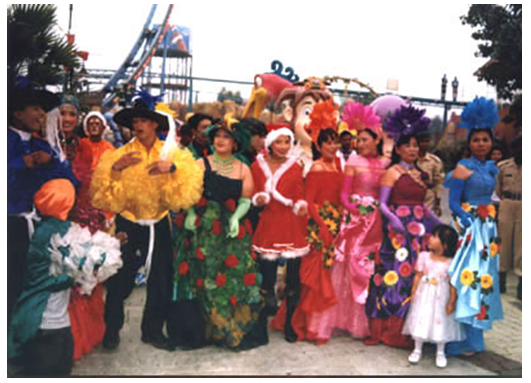 The member will get an ARM Band (all rides unlimited) to distinguish them from general visitors at every visit to FantasyKingdom. Special restrooms reserved for members. 3 (three) guests of the member will get 25% discount on entry tickets and access to Prince Ashu Lounge when accompanied by member. 20% discount on FK-Merchandise (at participating outlets). 10% discount on food item at Ashulia Castle & Water Cafe. Free information booklet of FantasyKingdom and Concord Products. Membership period: 1 (one) year. Exclusive use of air-conditioned Prince Ashu Lounge. 3 (three) guests of each member will get 25% discount on entry tickets and access to Prince Ashu Lounge when accompanied by members. Fun club member will get free entrance every Tuesday (Except Holiday). Member will get 50% off on entrance on other days (Except Holiday). Member will get 25% off on every Ride. Fun Club member’s Family (04) will get 50% off on Tk. 400 Ticket. Member’s accompanying person (04) will get 25% off on Entry. 15% discount on Fantasy Kingdom Merchandise Products. 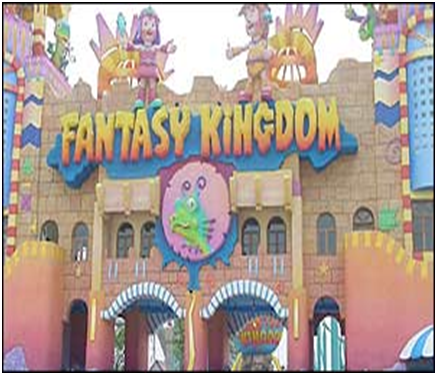 Member will get 25% discount on birthday & other parties at FantasyKingdom. The member will get 450.00 taka ride coupon (all rides once where applicable) at every visit to FantasyKingdom. 2 (two) guests of each member will get 25% discount on their entry tickets when accompanied by members. 10% discount on FK-Merchandise (at participating outlets). Member will get unlimited entry to FantasyKingdom for one year (ride coupon to be purchased separately). FantasyKingdom is going to launch WaterKingdom thin in a very short time. This project is under construction and more than 75% works of the project have already finished. Bangladesh is a country with a glorious history and rich heritage. Its natural surroundings, hills, rivers, valleys and plains, the villages and the countryside, the life style and customs of its people, archeological objects and other artifacts scattered all over the country, are all part of the history and heritage of Bangladesh, which we are proud to have inherited. It is extremely important for the present and future generations to know about our heritage and our history. This park is a humble effort on the part of Concord to highlight our history and heritage. What has been installed here are replicas of some architectural and archaeological objects as well as various other articles being used traditionally from time immemorial by the agro dependant common people of Bangladesh. 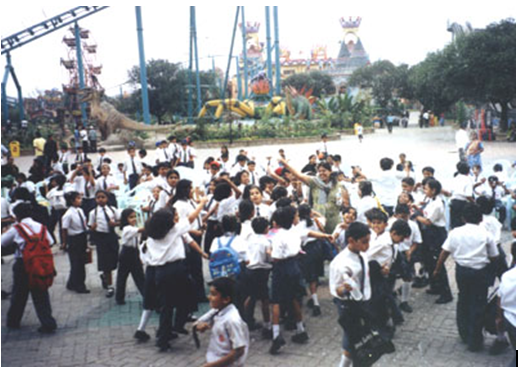 The park is developed to grow awareness among the young generation as well as to educate our overseas admirers about us. 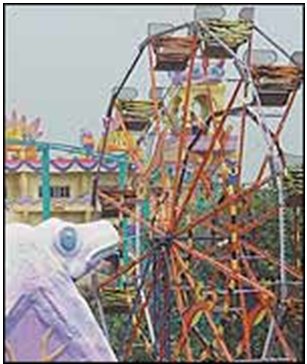 Everyone in the family can come to see the famous artifacts of Bangladesh and experience the exciting family rides. Visit an ideal Bangladeshi artisan village, taste our sumptuous Bangladeshi cuisine and experience much more. Regular events of native Bangladesh are also arranged here weekly. According to the management their targeted customer are middle class, upper middle class and upper class. They targeted that those peoples income level starts from 8 to10 thousands per month. But in our survey we find it clear that they have wrong idea about the market. The price they have fixed is not possible to bear for the people whose income level is8 to10 thousands. Our survey tells it that this income level might be 15 thousands plus. So it is clear that the main target customers of FantasyKingdom are upper middle class and upper class of the society. 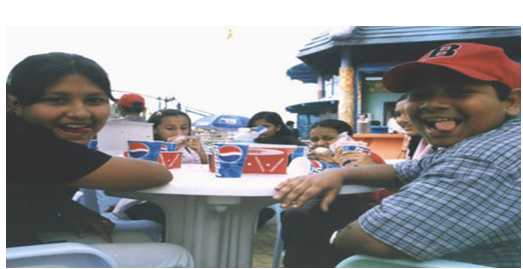 There are various people visit the park everyday and most of the people come from Dhaka city. Some people come from the surround districts of Dhaka like Narayangonj, Manikonj, Gajipur, Shavar etc. So it can be tolled that the target of FantasyKingdom are the people of Dhaka and surround district. Basically FantasyKingdom published their advertisement in daily newspaper they also poster their especial items in all over Dhaka city. They gives add on different add on different publication. The main media of their advertisement is Newspaper. Fantasy Kingdom also dependant on hand bill and poster for advertisement. Concord Engineers & Construction Ltd.
Concord Real Estate & Building Products Ltd.
Concord Ready-Mix Concrete Products Ltd.
Concord Prestressed Concrete & Block Plant Ltd.
Concord Real Estate & Development Ltd.
Jeacon Garments & Concord Fashion Export Ltd.
Concord Architects & Interior Décor Ltd.
We make two same type surveys on the visitors of Fantasy Kingdom and on the visitors of. Here is the some chart of our survey report..